The Fisher Isotemp Basic Magnetic Stirrer offers you dependable uniform stirring in this laboratory staple. The ample 6 x 6 inch bright white epoxy powder coated aluminum surface of this magnetic stirrer is chemically resistant and tough to ding up and can support up to 25 lbs. The speed range of this lab stirrer is between 60 and 1200 RPM and controllable from the analog knob located up front. 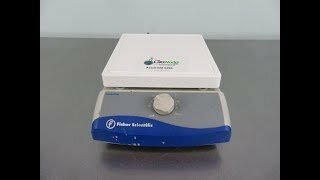 This Fisher Isotemp Basic Magnetic Stirrer has been thoroughly inspected and is performing to expectations. All of our lab equipment comes backed with our standard warranty. Should you have any questions, please don't hesitate to contact us.